President Obama has been trying to make the government shutdown as visible and painful as possible. 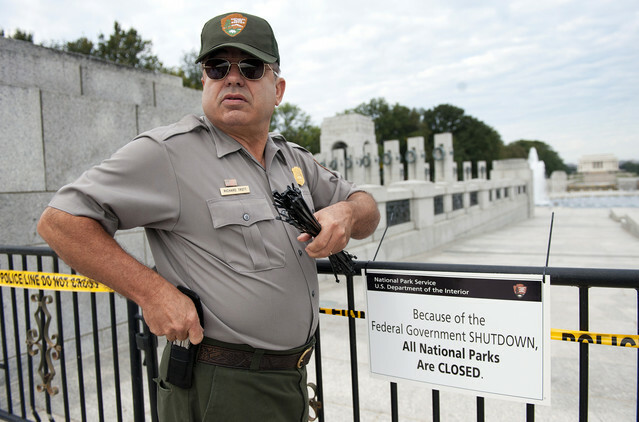 He has ordered the World War II veterans memorial to be "closed," preventing the otherwise free and unstaffed memorial from being accessed by thousands of veterans and tourists by cordoning off the area with what are being dubbed "barrycades" and stationing guards, some of whom are threatening WWII veterans with arrest. The Obama Administration is also spending money and manpower locking down the MLK, Lincoln, and Jefferson memorials, while nearly every Federal Government website (USA.gov, EPA.gov, Energy.gov, Ed.gov, Defense.gov, etc) prominently features a notice declaring that, due to the "lack of federal funding," the website is either unavailable or unable to be updated. And apparently the shutdown is even affecting Michelle Obama's ability to tweet. Remember, this is an Administration that only a few weeks ago promised we had enough money to bomb Syria. Meanwhile, Republicans in Congress are attempting a piecemeal approach to the Continuing Resolution and have passed short term measures to deal with these funding gaps, including funding for veterans' care, the National Guard, national parks and memorials, and cancer treatment at the National Institute of Health. Democrats have rejected all of these measures, and President Obama has threatened to veto them. Democrats have rejected three attempts by the Republicans to fund the government, but their partisan, uncompromising strategy to defund the entire government unless the train-wreck of Obamacare is funded is losing its credibility as these various political stunts are exposed. The top story in the Courier of Montgomery County noted that local residents were blaming President Obama for the shutdown of the Conroe Social Security office. People are more drawn to the Republicans' positive, unified message of funding the government without this unfair, unworkable law. It's time for Democrats to stop with the political charades and come to the table to work out a way forward for a Continuing Resolution. As Rep. Kevin Brady put it: "Closing the government is a serious matter. I call on Senate Democrats to back away from protecting their exemption from Obamacare and put the people first. After all, they wrote Obamacare- why do they refuse to live under it? And why keep the government closed to protect a special Obamacare waiver for business, but deny workers and families the same treatment? Shouldn't we treat all Americans the same? Sit down with House Republicans. Together, let's end this special treatment that no one can justify and get the government working again." Be sure to give your representative a call and urge them not to budge. Click here for a list of Texas Representatives' DC phone numbers. The issue is now, more than ever, in the Democrats' court. It's on them to step up, and the people know it.